1. HOW HAS THIS GUIDE BEEN CONSTRUCTED? This guide is intended to educate the consumer as to how an oven operating in ‘Sabbath mode’ can be used to keep food hot for Shabbos. Effectively, ‘Sabbath mode’ ovens can be split into two categories: those with an approved ‘Sabbath mode’, and those without. This guide provides instructions for the use of both types of oven. 2. WHAT IS ‘SABBATH MODE’ IN AN OVEN? In many cases, use of the word ‘Sabbath mode’ is a misnomer as manufacturers have not adequately researched the issues involved. When manufactured with input from a competent halachic authority, an oven working in ‘Sabbath mode’ is truly ‘Sabbath friendly’ as it complies with the laws of Shabbos – allowing one to access food which is heating in the oven. In all cases, the food must have been placed in the oven before Shabbos. 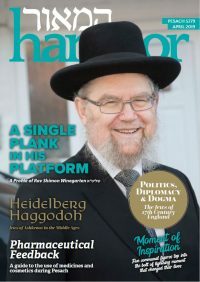 Here in the UK, an increasing number of models offer this mode, but are manufactured without halachic input; as such, their use on Shabbos must be evaluated on a product-by-product basis. Where available, information from the manufacturer can assist in the evaluation process, and one needs to consult a halachic authority on the correct use of these models. By their own admission, some companies have manufactured ovens which raise halachic concerns even if ‘Sabbath mode’ is operating. Members of the public are advised to research the model they are buying, and where necessary, to resort to other methods of heating food. 3. WHICH CONCERNS DO ‘SABBATH MODE’ OVENS NEED TO ADDRESS? A competent ‘Sabbath mode’ will address all issues by neutralising the effects of opening and closing the oven door on appliance activity. This mode also addresses issues related to convenience and technical design. Amongst them is an ‘auto cut off’ feature – designed to lower the risk of fires; this safety feature will halt oven activity after a period of time. To allow for the convenience of Yom Tov cooking, the oven continues to run for up to 72 hours, but at a relatively low temperature. 4. WHICH OVENS FEATURE AN APPROVED ‘SABBATH MODE’? To date, the only models which we have researched and found to feature an approved ‘Sabbath mode’ are models developed by NEFF, Bosch and Siemens (collectively known as BSH). If you have one of these models, please continue to Question 6. 5. I HAVE AN OVEN FEATURING ‘SABBATH MODE’ BUT IT IS NOT MANUFACTURED BY BSH. WHAT SHOULD I DO? If you have an oven without an approved ‘Sabbath mode’, there is no need to panic. Please click here to be taken to our guide on how to use an oven without an approved ‘Sabbath mode’ on Shabbos. 6. WHAT ARE YOUR INSTRUCTIONS FOR HEATING FOOD IN AN APPROVED ‘SABBATH MODE’ OVEN? To date, the only models which we have researched and found to feature an approved ‘Sabbath mode’ are models developed by NEFF, Bosch and Siemens (collectively known as BSH). Our conversations with BSH have resulted in sufficient information to establish that their ovens manufactured in the last few years may be used to heat food before Shabbos. Nonetheless, since the thermostat of the oven remains active even in Sabbath mode, opening and closing the oven door may only be done in accordance with halachic guidance. Here are our guidelines for use of the BSH oven in ‘Sabbath mode’. In ovens which carry an element indicator light, the door should only be opened when the light is ‘on’. In an oven which does NOT feature an element indicator light, food which is left in the oven over Shabbos MAY be removed during Shabbos but ALL food MUST be removed before the oven door can be closed again. Although we have recently launched our external indicator light, this is not compatible with the BSH Sabbath mode. However, a number of NEFF ovens have been found to have an alternative cooking mode which can be used on Shabbos in conjunction with our indicator light. See https://www.federation.org.uk/indicator-light/ for information on FedTech’s own indicator light project. It is important that members of the public contact FedTech before purchasing an oven which will have an indicator light installed. 7. 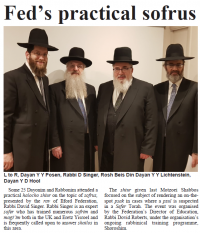 ARE THE GUIDELINES FOR YOM TOV USE DIFFERENT FOR THAT OF SHABBOS? The oven should be set to the desired temperature in ‘Sabbath mode’ before Yom Tov. No adjustments may be made to the temperature setting during the course of Yom Tov. Food may be placed in the oven to cook or heat on Yom Tov and need not be in place from before Yom Tov. The door may be opened and closed without limits as required during the course of cooking. It should not be opened for no reason. If an element indicator light is present, it is preferable to open the door only when the indicator light is lit.